We are delighted to see that mini-grids have become mainstream of discussions of recent conferences! Indeed, they are increasingly seen often as the most promising way of connecting a good share of the 1.1 billion people in the world who still lack access to electricity. 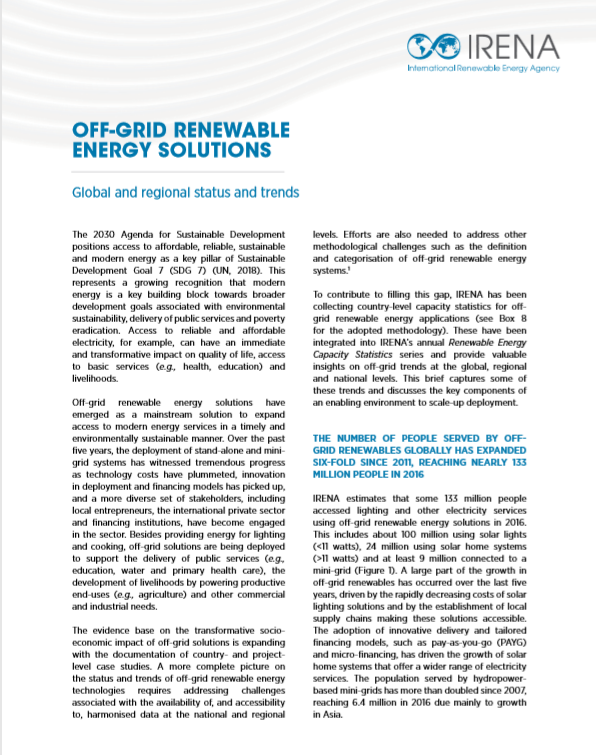 Recent projections by the IEA clearly identify mini-grids as critical to achieving universal access to electricity by 2030: over 440 million people will need mini-grid connections, requiring about 200,000 new mini-grids at a cost of around USD 300 billion. Yet, investors and financiers say there is not enough best practices and examples of successful business models, particularly from renewable energy mini-grids, that would make mini-grids attractive enough to put money into these “still new/early stage” off-grid initiatives. While individual examples of course do exist, what is missing are track records, evidence of scale and replicability. Investors are unwilling to put big money into replicating what might have been a lucky individual project. For this reason, ARE has decided to place data high on its agenda to focus on data gathering and aggregation to align ourselves with sector-wide data initiatives. Additionally, ARE is collecting best practices and case studies from Members on various topics, including successful partnerships between Members. The IFC has been collecting data from mini-grid developers across the globe since 2016. In May 2018, they released an updated report, which shows among other subjects, a drop in connection costs (Average Investment per User - AIPU) down to USD 920, from USD 1,163 in previous years. This decline in capital cost per connection is an example of key information that has not been available to investors, governments or anyone looking to spend money in the mini-grids space. A different example is of ARE Board Member, Mlinda, who conducts baseline, midline and endline studies in villages they have deployed mini-grids to gather social, environmental and financial impact data. Knowledge and progressively tracking the same has contributed to give assurance to their investors thus they continue to support their subsequent funding needs. Read more about Mlinda’s story in the Economist’s latest article: Empowering villages: Mini-grids could be a boon to poor people in Africa and Asia. As a result, ARE is keen to ramp up efforts to work with knowledge brokers in the research and finance space to integrate more data and involve as many ARE Members as possible in gathering data about sector performance and evolution. Platform for Energy Access Knowledge (PEAK), an initiative by ARE partner Power for All is an example of how best practices, case studies and research data can be integrated in a single platform to provide information necessary for off-grid project development and investments. 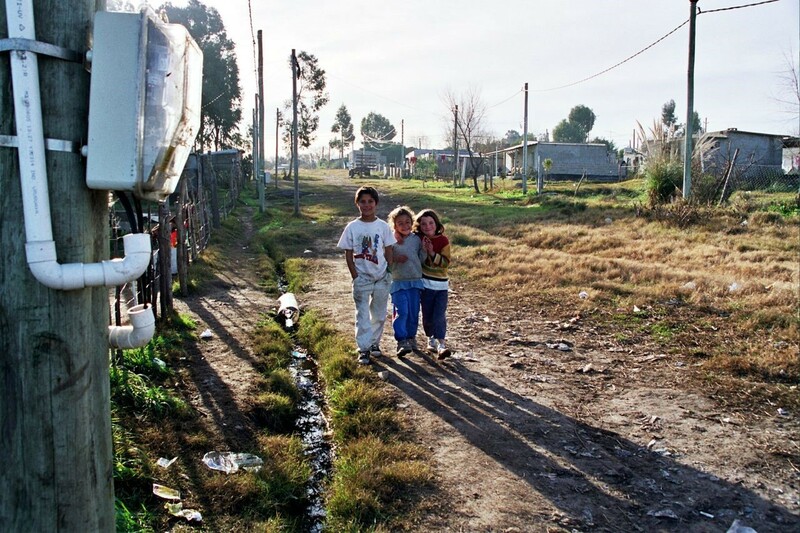 Moving on, ARE is actively advocating for the deployment of clean energy mini-grids worldwide. Learn more about the opportunities of mini-grids in the next months: Philippines Mini-grid B2B Forum, Energy Storage China, AICC Network Launching Event and the 4th International Off-Grid Renewable Energy Conference to name a few. Further events can be found in the newsletter below. Finally, to find out how ARE can help you to achieve your business goals, please contact me directly. Since July, we are pleased to welcome five new companies: Outback Power, RTSoft, SolarGen Technologies, Sunrise Solar Solutions and Trina Solar. We look forward to working with you! Mini-grids have a long history as integral parts of the early power sectors of many high‐income countries. However, they have only recently emerged as a serious, scalable solution to providing large groups of people in developing countries with access to timely and affordable electricity. Indeed, recent projections by the IEA clearly identify mini-grids as critical to achieving universal access to electricity by 2030: over 440 million people will need mini-grid connections, requiring about 200,000 new mini-grids at a cost of around USD 300 billion. To help catalyse large-scale global investment in mini-grids, the World Bank is developing a large, and growing, portfolio of energy access projects that include a mini-grid component: to date, 32 electrification projects (28 approved, four in late-stage development) with a mini-grid component, spanning 28 countries and representing a commitment of over USD 650 million through 2025 just for mini-grids. These projects leverage an additional USD 1.1 billion from other donors and the public and private sectors for mini-grids and are expected to build over 2,300 mini-grids, providing electricity to almost six million people. Hosting or co-hosted global mini-grid events in Tanzania, Kenya, Myanmar, and Nigeria. 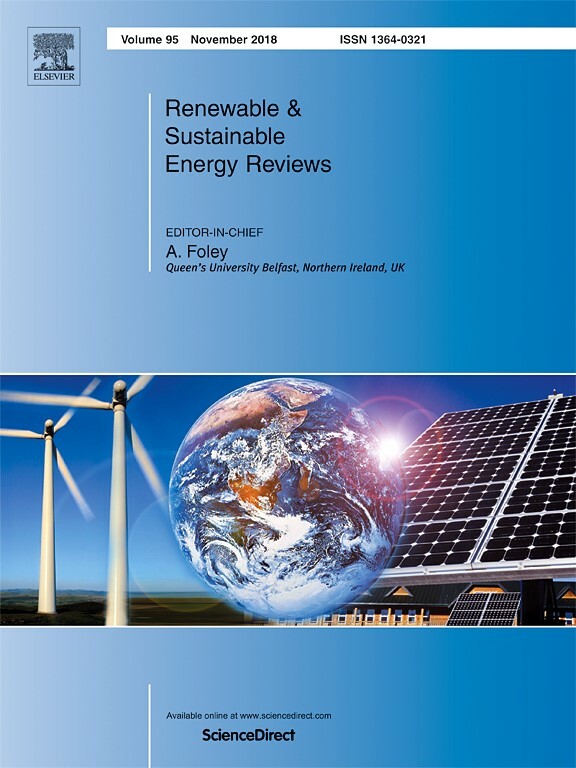 Forthcoming publications include six country-specific case studies, a cross-country comparison of mini- grid regulations and subsidy options, a study of what happened when the main grid arrived in mini-grid service areas in three countries, and a comprehensive mini-grid market report. These will complement the World Bank Group’s existing library of mini-grid publications, including the IFC’s “Operational and Financial Performance of Mini-grid DESCOs”, ESMAP’s “From the Bottom Up”, the World Bank’s “Rural Electrification Concessions in Africa : What Does Experience Tell Us”, and the LiveWire Brief “Scaling Up Access to Electricity : Emerging Best Practices for Mini-grid Regulation”. How to get rid of your diesel generator! Should you really? Mini-grids powered by renewable energies will play an important role in extending, enhancing and greening electricity services in remote or yet unserved regions. The frequently used phrase “powered by renewable energies” implies a fully renewable energy system without fossil fuel powered generators. Your initial reaction would probably be: “Yes! Finally, I can get rid of my thirsty, noisy and dirty fuel guzzler!” Let’s find out if you really should and register for the content-based free live webinar. We will look at the case for a purely diesel powered mini-grid where PV and storage is gradually added to eventually end up with PV as the single source of power (stand-alone). Adding a nearly standard grid-tied PV system to your mini-grid will achieve solar shares (i.e. diesel fuel savings) of up to ~40%. Up to ~50% are in reach if you also add a power smoothing storage system (“buffer”). By the way, at this point the power rating of your PV system might already exceed your peak load (“PV penetration rate >100%”). Please do not worry, this is a standard scenario; the rate needs to rise even more to reach our ultimate goal. Still, we are not yet able to switch off the diesel generator (not even for a limited time). It seems a paradox, but we first need to add another piece of equipment (battery inverter) that takes over the responsibility of the generator to “form the grid”. Combined with an increased storage size, the batteryinverter now lets us switch off the generator during the day. Add more storage and the generator will serve as a backup only, i.e. running occasionally to recharge storage with off-times spanning days or weeks. Our journey to get rid of the generator, having gradually increased PV size and storage capacity, means we can now cover up to 95% of our energy demand by solar. The PV penetration rate might have reached more than 200% by now. Let’s now go the extra mile and get rid of our generator completely: a bit more PV and storage? If only it was that easy! With no generator we lose our backup option. For PV and storage to take over this responsibility (under any weather condition!) a gradual increase of size is insufficient: it needs to be an exponential leap. While the unit cost (LCOE) of our stand-alone PV-storage system might still be lower than that of the generator, CAPEX are definitely not. So, should you get rid of your diesel generator? Maybe start looking for alternative fuels first. Free Live Webinar: You are invited to deepen the topic on an interactive level in the form of a free live webinar prepared by Renewables Academy Online. Register now to discuss the topic with the author and RENAC expert for solar energy and rural electrification, Lars Koerner. In a mini-grid with distributed energy generation and frequency control, surplus energy from individual installations can be shared with the rest of the mini-grid, increasing the global PV usage of the system. This results in lower installation and operating costs as there is no need to oversize individual PV installations or batteries, and only one diesel generator per mini-grid is needed. 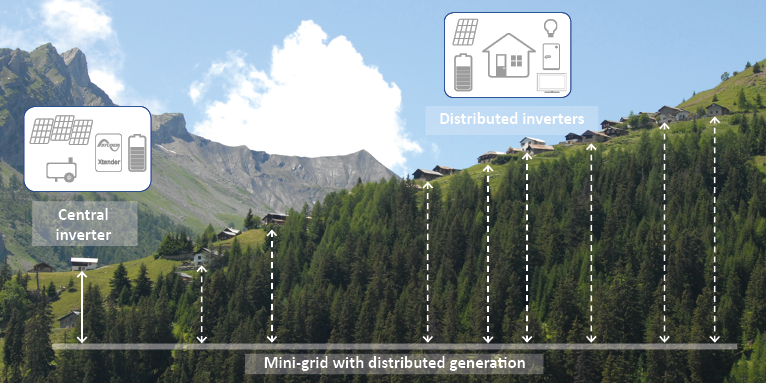 Six years ago, Studer Innotec built a distributed mini-grid pilot project in the Swiss Alps for a village at 1,700 m altitude called "Mayens sur le Scex". Over time this solution has proven to be robust and stable, receiving positive acclaim from the community as it has perfectly adapted itself to their needs. 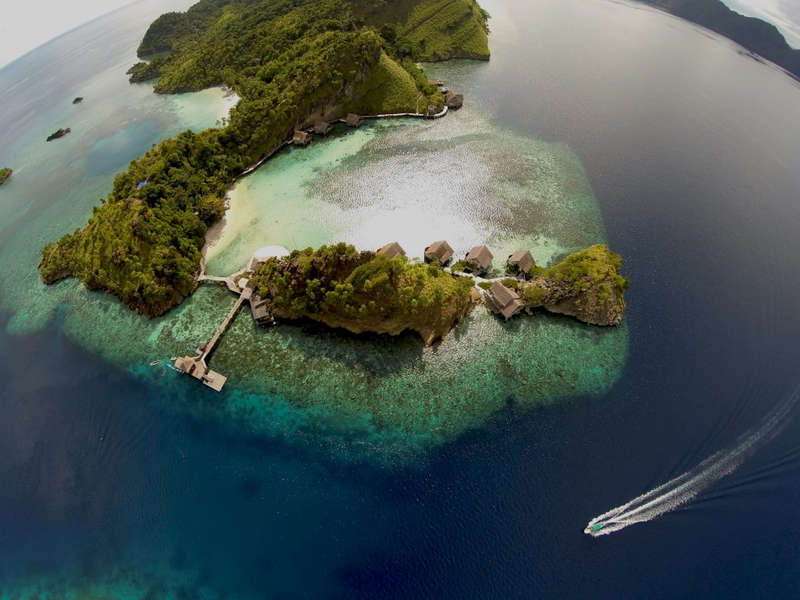 Initially many of the 32 chalets were already equipped with individual PV systems with diesel generators as backup but their occupancy rate was low, the batteries often full and a lot of solar energy was lost. To address this situation an alternative mini-grid solution was developed taking in consideration the wishes of the local community. Among their demands were: the possibility to keep their energy independency, the flexibility to add power in the future if needed, reduce the cost of system infrastructure, and to avoid having one big central PV installation with solar panels in the landscape. 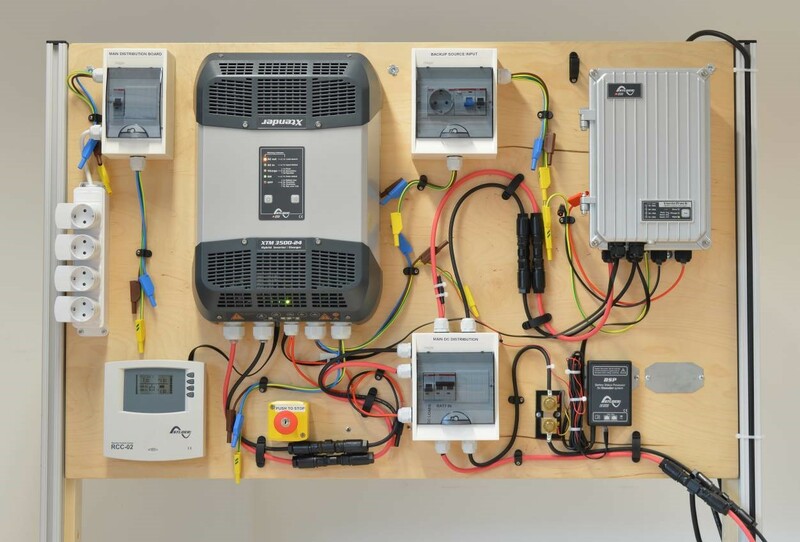 The novelty of the distributed mini-grid is combining several individual systems together to share their common benefits, maximizing the use of excess energy, and extending the individual battery life. The system is based on a central inverter which provides a reference voltage and uses variation in AC frequency for communication among system components. A low voltage AC distribution line is connected to every house. Each house has its own individual system with PV panels, inverter/charger and battery bank. A set of energy management rules ensures smooth energy exchange and the successful operation of the mini-grid. This is a highly flexible mini-grid solution, so it is possible to add additional distributed inverters, to use different battery technologies and to use AC-coupling with all sorts of energy resources such as solar, wind or hydro energy. If desired, it is also possible to add a smart metering function, where a tariff structure defines the quantity of electricity to be used among the mini-grid participants. For more information, see the video on YouTube (https://youtu.be/4aGvNELr8aw) or download the whitepaper "Mini-grids with distributed energy generation and frequency control" from our website (www.studer-innotec.com/en/downloads/). XANT has delivered wind turbines for all kind of mini-grids across the globe: from a wind-diesel system in a fishermen village in Alaska to a large multi-MW system in the Pacific to an experimental system on a demonstrator. If systems are being configured without considering wind power, this might lead to non-optimized systems and thus higher-than-necessary electricity costs. Often mini-grids nowadays are still combined with a “dispatchable” power generation technology, however, with the sharp decline in storage technologies the path is paved for 100%-renewable systems. What would such a system look like? To simplify things let’s only consider the two renewable-energy sources that are available on every location on this earth: solar and wind power. 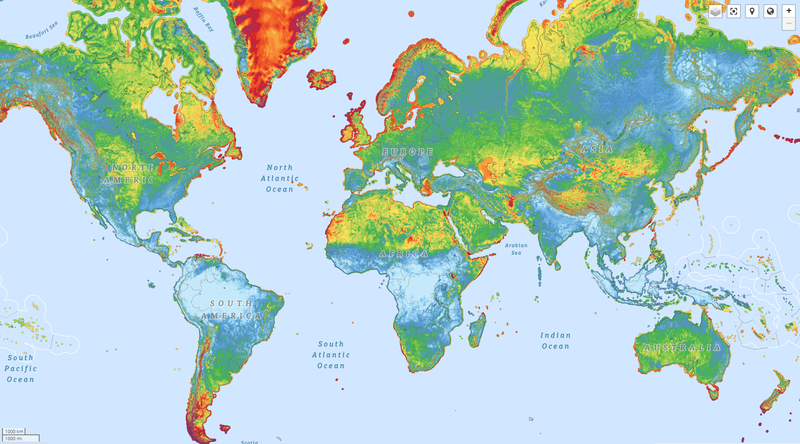 The Energy Sector Management Assistance Program (ESMAP) of the World Bank has done a great job in mapping the global wind and solar resource data and making them publicly available in interactive maps. At first sight the two resources seem to complement each other quite well: wind is abundant at higher latitudes while the irradiance levels increase towards the equator. Also, the sun shines the brightest at higher altitudes while the wind blows the hardest near the coast lines. To dig deeper we ran a bunch of HOMER simulations with the same system configuration providing power to a typical village load (250kW peak, 2MWh/day electricity demand). 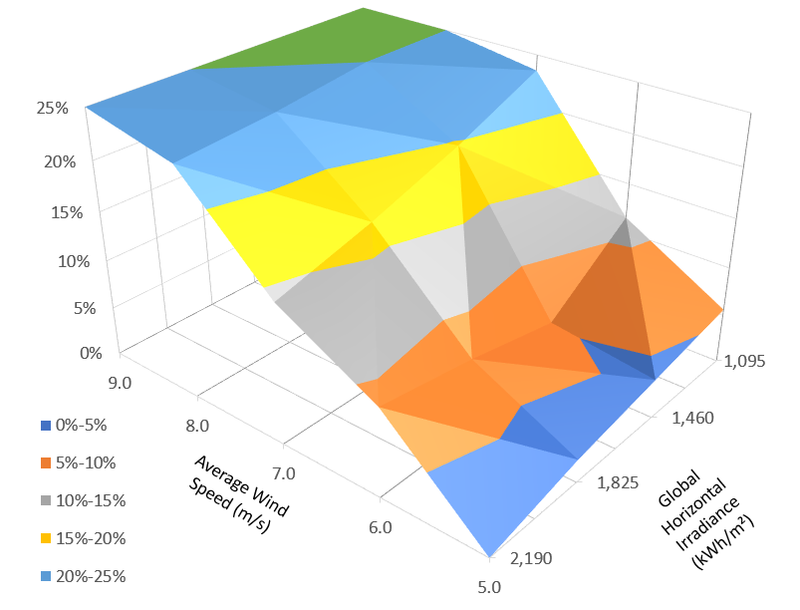 Investment costs of solar, wind and storage are deemed to be representative of today’s total installed cost at remote locations (respectively 1.2$/W, 2.5$/W and 500$/kWh) but are obviously not considering the large local variations that may exist due to temporary market shifts and/or incentive schemes. Also, these costs are not for MW-scale power plants but for wind turbines and solar arrays in the tens to hundreds of kW’s. The HOMER Optimizer then does the job of finding the lowest-cost system comparing all the feasible system configurations. 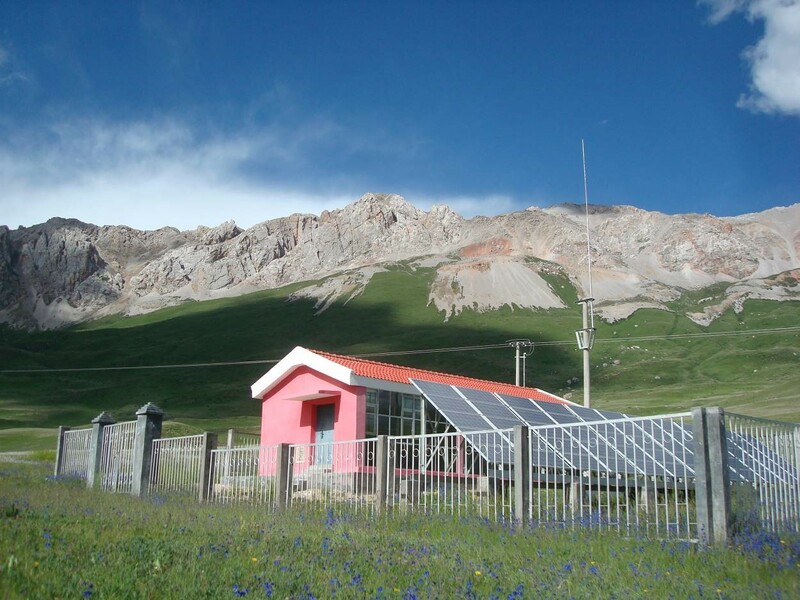 In Chilean Patagonia the lowest-cost-of-electricity system (COE) would consist of 135kWp PV, 300kW wind and a 1.3MWh battery and deliver electricity at 25cents/kWh. While in eastern Ethiopia, an LCOE of 22cents/kWh is obtained with 420kWp PV, 100kW wind and a 1.3MWh battery. The graph below shows the reduction in LCOE obtained when adding wind power to the mini-grid system. Adding wind to the mix can bring the LCOE down significantly: a 10% reduction is already achieved at wind speeds of 6m/s, and up to 25% can be achieved at higher wind speeds. So, what had been proven in larger interconnected systems, also holds for Mini-grids: wind and solar are better together. Thanks to their complimentary in diurnal and season patterns, wind and solar together can always match the load better than alone and the necessary amount of storage can be reduced. So, include wind in system-sizing calculations, otherwise you’ll never know what COE you could have got ! 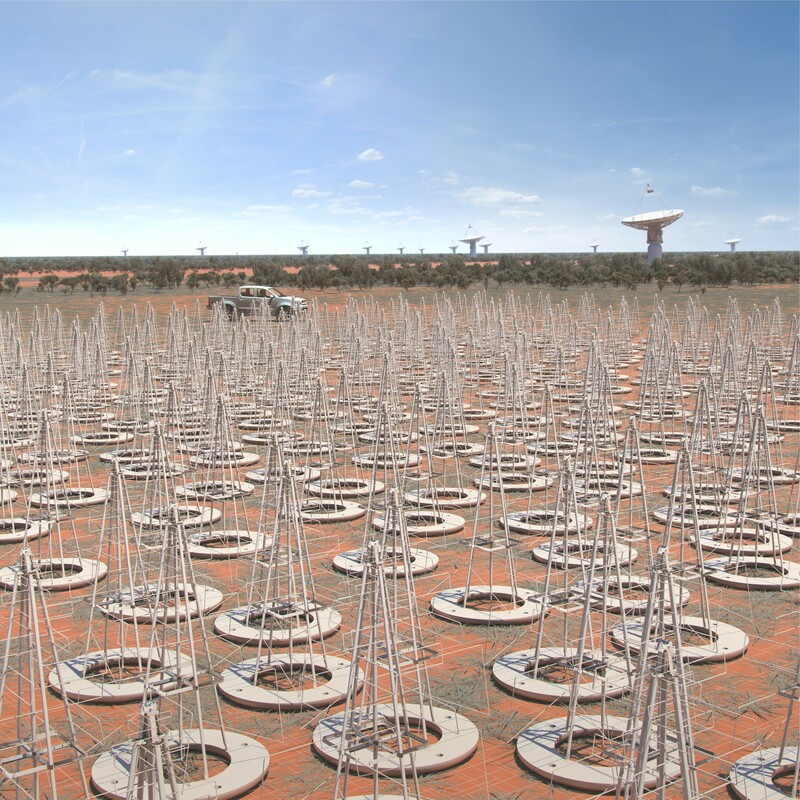 The Square Kilometer Array (SKA) project is an international effort to build the largest radio telescope ever. With a capital expenditure ceiling of Euro 650 m, first construction phase is expected to start within coming months. With our long-term experience and vast expertise in the design of hybrid power systems integrating high shares of renewables, conventional power sources and storage technologies within isolated or grid connected applications, our team at Fraunhofer ISE took part in the design and planning phase of the power system for SKA Low1, which will supply more than 130,000 antennas and required data processing. Due to the magnitude of this scientific equipment, which will cover more than 100,000 hectares at MRO area in West Australia, its power consumption is comparable to that of a town, a small city, or an island. Expected energy consumption is 25,000 MWh/year at average power of about 3 MW. In our assessment, especial attention was put to site topology, renewable energy potential (solar, wind), to specific system requirements, and to the particular economic and financing environments. Storage is well known as key element for enabling high penetration of renewables in power systems, but it is also (still) generally the most expensive component of such. Therefore, detailed lithium-ion market projections were adopted and incorporated to our complex battery performance and degradation models. Following a design spiral methodology, a simulation model was set to optimize both size of PV-diesel-battery components and its spatial distribution, comparing a centralized concept, with reticulated transmission lines, to a decentralized power supply where the farthest antennas are fed from local power plants. Importantly, optimal renewable penetration was found to surpass 95% at this site and for this application, favored by high diesel prices and O&M costs. Optimized system configuration was obtained to consist of a total of 19 MW solar PV, 45 MWh lithium-ion ESS, and 3.5 MW diesel back-up. Regarding spatial distribution, our study showed that a central power station covering up to 90% of the total power budget was economically preferable, with transmission lines covering up to 20 km of radial distance from the Central Processing Facility. Antennas at longer distances should be powered from local power stations. The levelized cost of electricity, LCOE, was estimated at 0.28 €/kWh, and sensitivity analyses were presented to observe how changes in most influencing variables could affect project costs. Independent engineering and quality assurance offered from Fraunhofer ISE, such as the study presented here, can minimize risks to customers, project developers and investors, facilitating or enabling its bankability and insurability. How can we speed up the energisation of Africa? A new IDEA is needed! Africa urgently needs to address the widespread lack of energy access and meet the SDG7 goals. Due to population growth, Sub-Saharan Africa (SSA) will soon account for 90% of the 674 million people worldwide without access to energy, 80% of which live in rural areas. The typical top-down approach based on international public funding will not meet the long-term needs of these communities. SNV believes that Integrated Decentralised Energisation in Africa (IDEA) is an effective way to dramatically increase energy access, reaching communities who need it the most. We are now looking for partners to help develop, fund and implement this new IDEA. There have been many initiatives in SSA to facilitate energy access for rural communities - from household stand-alone systems to multi-village mini grids. But these have generally taken a siloed approach that considers only one type of energy delivery. This fails to recognise that a mix of energisation options is most cost effective, using appropriate and innovative business models to make this option affordable. For many rural African communities, access to household electricity simply isn’t enough - the use of energy for agricultural production is crucial. Supporting farmers and SMEs to grow their businesses raises income levels and enables investment - increasing the electricity demand and therefore making the connection more cost-effective. An example of this integrated approach in action is the Mashaba mini-grid in Zimbabwe - a project supported by SNV. Here, the mini-grid provides household energy, and energy for local businesses, the local school and a health clinic. It pumps water to irrigate local farmers’ fields so that yields are increased by 50%. More profit means greater demand and reliable payment for the operation of the mini-grid. To engage private investors, an attractive financial model is needed. The private sector is often deterred by the uncertainty of local conditions. This risk can be mitigated by using public funds to offset the initial capital requirement – justified on the basis that energy supply is a basic public service. In turn, this support will attract private investment for the operational costs (a practice that isn’t yet commonly used by suppliers). Supporting local agriculture businesses to increase electricity demand and create a viable market is the motivation behind SNV’s IDEA concept. This approach will demonstrate different business models, involving different types of finance in communities across a number of countries including - Zimbabwe, Zambia, Burkina Faso, Benin, Rwanda and Ethiopia. SNV will work with local governments to ensure that the necessary frameworks are in place, and use our country offices to implement sustainable, local business approaches. If you would like to learn more about IDEA please contact Dean Cooper, SNV Market Development Manager at dcooper@snv.org. 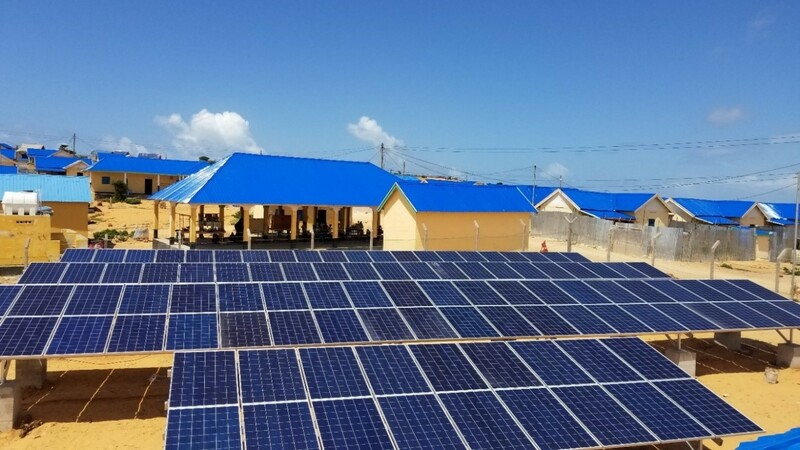 SolarGen Technologies Limited was contracted by the American Refugee Committee (ARC) International in March 2018 to supply and install a 40 kW solar mini-grid to electrify 100 connections and five public facilities at the Farjano resettlement scheme in Kismayo, Somalia. The project which is funded by UNHCR was completed in July. It serves a local school, health centre, police post, welding shop and market stalls among other socio-economic needs. 40 solar street lights were also installed in the settlement. The system consists of 112 pieces of 265 watt polycrystalline panels with an installed capacity of 38kWp and 48 pieces of OPzS maintenance free sunlight batteries (192 KWh). It was designed to ensure that this capacity can handle the current load and at least 40% expected growth in the next 5 years. It has a 40 KVA diesel generator back-up. The system is the first of its kind in Somalia with a smart metering capability and makes Farjano the first community in the nation to receive 100% of its energy needs from a solar system. Somalia faces a major challenge in the access to affordable and reliable electricity service. Over 10 million Somalis lack access to basic electricity, 2.1 million live in the margins of food security and 1.1 million are internally displaced (World Bank, 2018). The Horn of Africa nation has no grid connection and suffers one of the highest electricity tariffs in the world at a cost of $ 1/KWh. This makes it difficult for the average citizen to afford electricity. The SolarGen developed mini-grid will provide electricity at a cost of between $ 0.40 and 0.60/KWh. SolarGen, a leading locally-owned renewable energy company that specializes in the design, installation and distribution of high quality solar products, prides itself as a development partner for communities in some of the toughest locations. While implementing the Farjano mini-grid, it faced several challenges including the lack of skilled local work-force and had to maximize on its team of engineers and technicians to ensure the successful and timely completion of the project. The company is currently training two Farjano community members who will be employed as the system operators. For the next six months, SolarGen will handle maintenance of the mini-grid as it works closely with the Farjano Energy Cooperative - established to manage collections from the mini-grid. The revenue will be used for the O&M of the system. 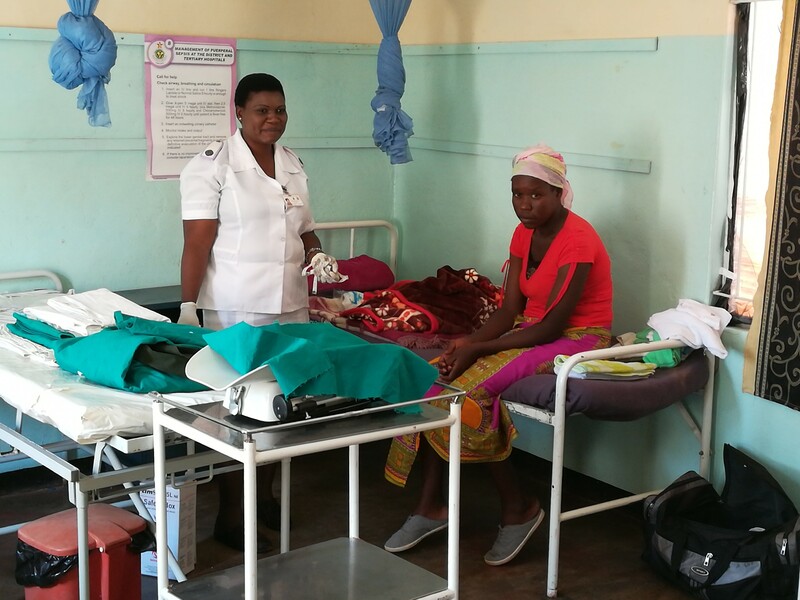 Portable, battery-powered ultrasound scanners have been eagerly embraced by rural health clinics in sub-Saharan Africa, helping OB-GYNs improve prenatal care and birth outcomes. But recharging one of these devices can still mean a long hike along rugged dirt roads just to access a reliable source of electricity. Until recently, practitioners at a clinic in the Ethiopian village of Ashoka had to ration the use of their scanner to preserve battery life and minimize recharging treks to the nearest town connected to the grid. 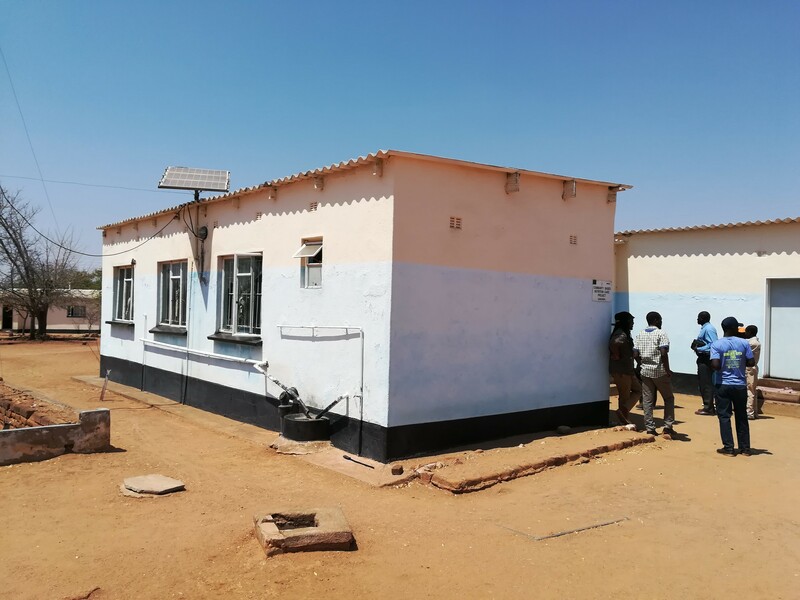 And at a larger clinic 15 kilometers away, where as many as 30 babies a day are born, there is connection to a grid—but even its electricity sometimes fails. Until recently, there were times where, at night, staff used cellphone flashlights during deliveries and to check patient charts. Today, both facilities are on their own reliable micro-grids powered by a new, reliable technology—hybrid distributed power (HDP). There’s now electricity for scanners and baby warmers; fans have been installed; and the comfort level for staff, mothers and newborns has improved considerably. One clinic has even taken on the role as an impromptu community center where people gather at night to socialize and take advantage of the light, saving on precious kerosene. This clinic is the only places perhaps within a 20- or 25-kilometer radius of the village that has consistent electricity. Talk about transformative change: This is technology that can create healthier communities in regions where many people still live without electricity. And the promise is exciting for GE as well: With a long history of innovative solutions in the power sector, we’re now looking to collaborate with companies who can partner with us to bring these life-changing solutions to populations around the globe. From licensees to marketing partners, my team and I see tremendous opportunity in teaming up to illuminate more villages and create stronger, healthier, upwardly mobile communities in developing markets around the world. GE can deploy a number of different business models—ranging from power island supplier to technology licensor—to help our partners build, sell and install the physical power islands that produce the electricity, which allows for mass, rapid scaling. How does the technology work? Hybrid power leverages synergies between multiple generation sources. 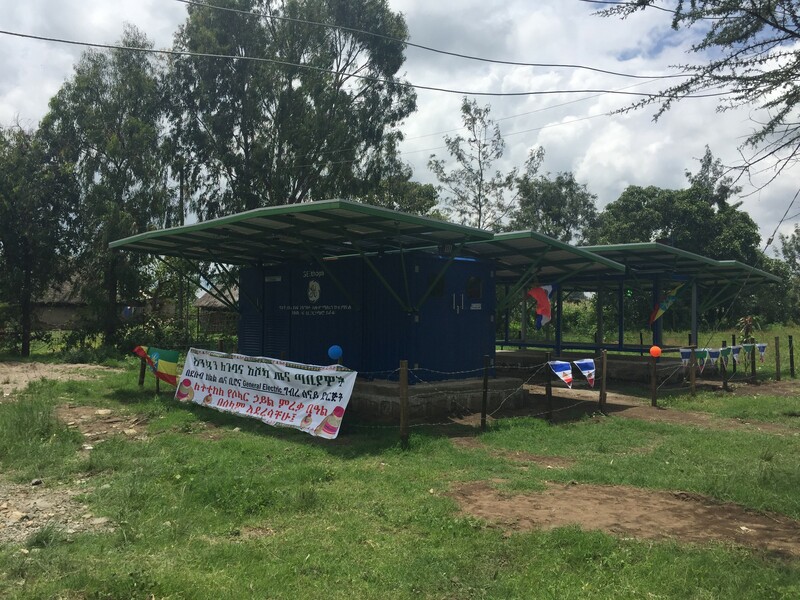 The HDP configuration electrifying the clinics in Ethiopia combines solar, storage (batteries) and diesel power into a self-contained unit roughly the size of a 20-foot-long shipping container. A smart box, controlled by software algorithms, switches between the three sources as needed and securely transmits data to the cloud via cellular networks for remote monitoring. The overriding intelligence of the system is geared toward maximizing solar production, with the diesel component kicking in and boosting efficiencies during rainy or cloudy weather. It’s catching on. An HDP-powered mini-grid recently came online in northern Ethiopia, providing electricity to about 180 homes in a remote village some 180 kilometers from the capital city of Addis Ababa. GE Renewables is sponsoring the installation as a Corporate Social Responsibility project, in partnership with Ethiopia’s Ministry of Energy. These efforts take “team.” Key technologies behind HDP originated within GE divisions that provide complex renewable energy systems to large utility customers. A group at GE’s global research center in Bangalore, India, fostered the idea of adapting GE’s expertise in renewables, storage and distribution at utility (megawatt) scale and shrinking it down to kilowatt scale to power micro-grids for rural electrification. They envisioned a robust, hybrid offering for deployment in remote, hard-to-reach areas to provide reliable, continuous power that was cost-effective, easy to use and could be readily scaled as demand grew, without requiring customized add-on solutions. We moved quickly: The concept went from a PowerPoint slide to an in-field pilot in nine months. GE Ventures’ licensing operation incubated the HDP offering and partnered with India’s Tata Power, a customer of GE Grid Solutions, on two pilot projects. At one site in Bihar, India, in addition to providing electricity to 150 homes the HDP solution is powering agricultural projects, including a rice mill. And in another village of 180 homes it’s powering a women’s school and a study center for children. The communities and Tata together decided how to deploy HDP, with Tata also setting up distribution links with usage metering to homes. 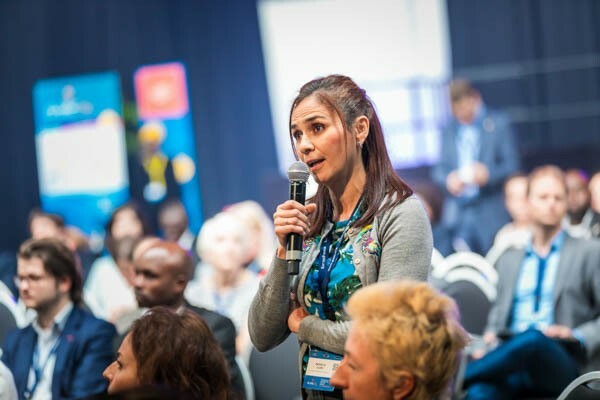 Collaborating with creative entrepreneurs and forward-thinking partners around the world allows GE and its partners to unlock new opportunities and create value, while solving important problems, transforming industries and improving lives. This will, we hope, mean a brighter future for the estimated 1.2 billion people on the planet who still live without electricity. 300 million people in India still lack access to basic electricity. For decades, these mostly rural poor have waited in vain for the grid to arrive and provide reliable, affordable power and, more importantly, enable the benefits of that power: clean water, better healthcare, connectivity and business opportunity. Until the last decade, the grid was largely untouched by new technology. But a wave of innovation, the plummeting cost of solar and breakthroughs in storage have resulted in a revolution in distributed energy and the emergence of mini-grids -- small, localized power plants and distribution networks that serve remote communities. Tackling rural electrification by building smaller (often privately- or collectively-owned) grids is not new. According to the International Energy Agency (IEA), mini-grids are a USD 300 billion investment opportunity between now and 2030, and also the least cost option for almost half of the people who still need to be electrified. The reason is simple: besides being deemed by IEA as the most affordable option, mini-grids also create more impact per dollar, are better at serving the needs of rural consumers, are faster to deploy, deliver power more reliably and with higher quality, and help create more vibrant local economies. 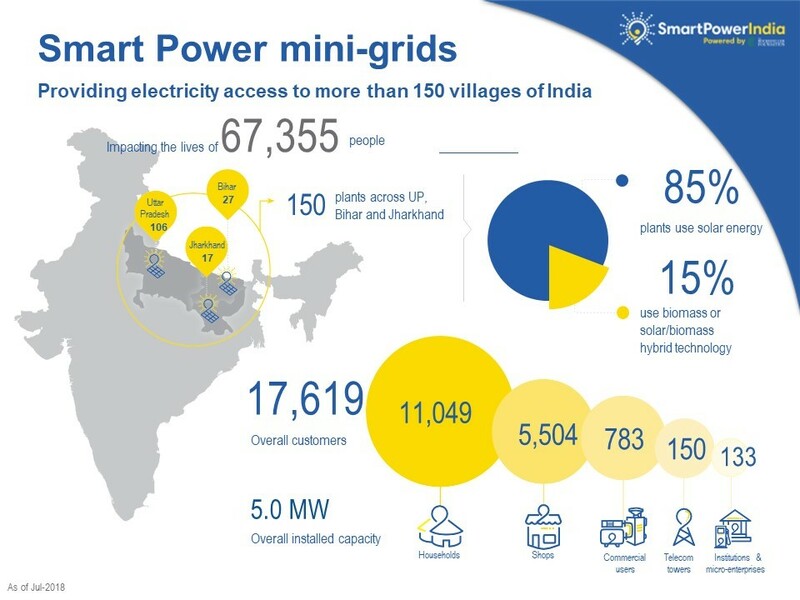 In India, Smart Power India, with support from the Rockefeller Foundation, is supporting the largest single cluster of private mini-grids so far -150 and counting -- showing significant impact on local communities, including new business creation, increased revenues for existing local enterprise and a rise in village per capita GDP. Financing for mini-grids is also increasing. Two leading Indian mini-grid developers supported by Smart Power India, Husk Power Systems and OMC Power, recently netted a total of about USD 30 million in investment. Unlocking greater financing can partly be accelerated through further innovation to standardize mini-grid design and drive down systems costs. Field testing already underway in India to develop a “Utility in a Box” -- a modular, scalable mini-grid -- has significantly reduced the capital expenditure of mini-grids. Full and fair integration of mini-grids into national plans will help create a more level playing field. Currently, private utilities developing rural mini-grids are expected to deliver a service equal or better to the main grid, but most often without the public support that state utilities receive to prop up their operations. These force mini-grid developers to pass the costs on to the consumer, something state utilities in India can avoid, despite the fact that they have long been debt ridden. Government and donor support must be solution agnostic, and provide equivalent incentives to all sizes of grids, so rural communities get the solution best suited to their needs and we ensure that those still living without power do not wait decades more. 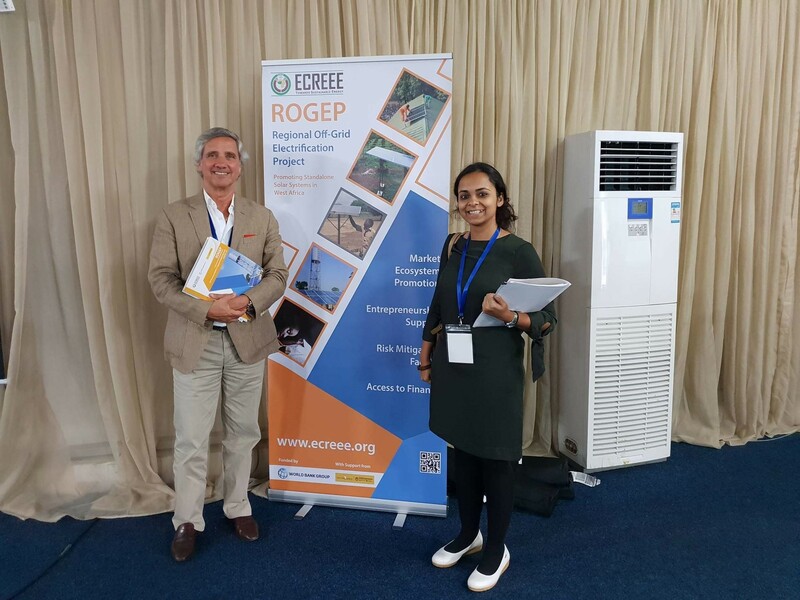 The 2nd Regional Workshop of ROGEP engaged a participation of a diverse group of stakeholders from all the ECOWAS member states, Mauritania, Chad, Cameroon and Central Africa Republic and outside the region. 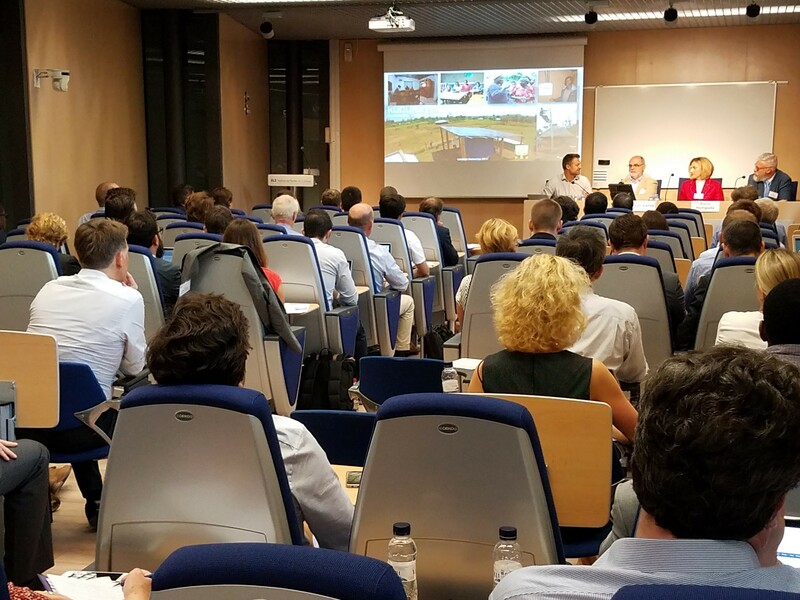 ARE was actively involved in the B2B event organised by ECREEE exchanging business opportunities with the local entrepreneurs from the off-grid solar industry. ARE Member Wuppertal Institut / WISIONS organised the webinar to delve into the topic of productive use, focusing on the pitfalls and opportunities of PURE projects. ARE Policy & Business Development Manager David Lecoque presented ARE Member case studies and success factors for such project. The 60 participants were mainly African, European and Asian, with almost half of them coming from the private sector. With more than 12,500 visitors and 240 international exhibitors, the 6th Intersolar South America exhibition and conference is the key platform for promoting solar technologies in the region. Given the advanced status of electrification in urban areas, this year, ARE has decided to focus on clean off-grid in remote communities. For this purpose, and based on very good participation last year from inside and outside Brazil, ARE, via its Member Unai Arrieta from Trama Tecnoambiental (TTA), once again organised a half-day off-grid workshop, focusing on empowering communities through clean energy access, with our local partners IDB and OLADE, as well as with Schneider Electric as sponsor for the networking reception. Over 70 experts and practitioners from multiple Latin American countries, including ARE Members Trama Tecnoambiental, Schneider Electric and LEDsafari, joined this initiative. What support is needed for rural communities to access clean energy? The report "Access to energy services through Renewable Sources in LAC" [NOW Available in Spanish] prepared by ARE and commissioned by the Inter-American Development Bank (IDB) which provides valuable reflections and lessons learned on clean energy access projects from the business association perspective, was also presented in this occasion. The Microgrid Global Innovation Forum will focus on micro-grid advances, case studies and applications in EMEA, Asia-Pacific, and Latin America. Organised by the Smart Grid Observer, the event will examine positive business models for a range of microgrid deployments, as well as real-world case studies in both grid-tied and off-grid/remote environments. ARE is pleased to be an official Association Partner for this event. Please also learn more from micro-grid developers from ARE Members: EDP Renováveis, Infinite Fingers, IPS, Practical Action, Rafiki Power, Schneider Electric, SparkMeter, THEnergy and Trina Solar. The conference will also address Micro-Grid feasibility, design, and implementation as well as solar + storage advances and project financing. The Philippines Mini-Grid B2B Forum is the 1st ARE business-to-business event in Asia and we are glad about the impressive response received so far! The Forum will identify opportunities for investment in renewable energy mini-grids, share knowledge of innovative technical solutions and link key players in the Philippine energy sector, such as electric cooperatives, with international mini-grid experts and potential financiers. The Forum is organised by the Philippine Department of Energy (DoE) and ARE with the support of the European Union through its Access to Sustainable Energy Programme (ASEP), in line with the objectives of the UN 'Sustainable Energy for All' initiative. As a subsidiary organisation to DoE the Philippines National Electrification Administration (NEA) is one of the supporting organisations. 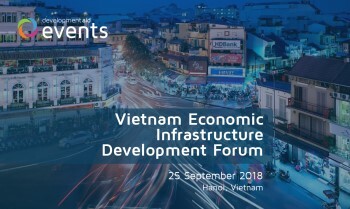 The Forum will bring together more than 100 local and international players in the off-grid electrification sector, including technology providers, project developers and investors, as well as local electric cooperatives and public sector agencies such as the National Electrification Administration (NEA), National Power Corporation (NPC) and the Energy Regulatory Commission. Participants from local governments, foundations, research institutions and grassroot organisations are also expected to attend. Registrations have been temporarily closed due to a large interest in the event. 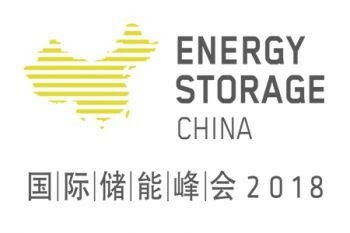 Together with Energy Storage China (ESC), ARE will co-organise a top level Microgrid Workshop parallel to the conference. ESC focuses on technologies and applications for the energy storage industry, while ARE covers the entire renewable off-grid solutions value chain. Several ARE Members CES-India, Energo Labs, GE Ventures and Zhejiang Chilwee Power will speak in a panel discussion on "Microgrids in Emerging Economies and on islands". The Micro-Grid Workshop aims to move the market forward, bringing together thought leaders, energy industry executives and project managers from around the world for intensive networking and information sharing concerning the design, implementation and operation of global microgrid systems. The emphasis is on maximising the effective use of renewable and distributed energy resources, refining the business model for a range of microgrid applications, and sharing real-world microgrid case studies in both on-grid and remote environments. The forum is expected to draw more than 200 professional participants, including industry experts, policymakers, government officials and developers. Power Nigeria Exhibition & Conference provides the perfect platform to work towards adopting clean, affordable and sustainable energy solutions in Nigeria. This opportunity provides access to regional markets, insight into the latest innovations, and connects you with various stakeholders. ARE is a supporting organisation of the Exhibition & Conference. We are also delighted to announce that ARE Board Member Prosper Magali from Ensol will be sharing, in the session “Productive Use of Renewable Energy (PURE) and the forecast role of mini-grids”, experiences learnt and challenges from rural African communities in adopting renewable energy, and recommendations to stimulate its spread and better realise its potential. The free-entry conference also provides credible firsthand information on the latest power solutions in Nigeria such as mini grids initiatives, smart meters, solar projects and the implementation of blockchain within the power sector. The Business Forum is organized as a pre-event of the High-Level Conference on “Regional Cooperation to Accelerate Sustainable Energy Innovation and Entrepreneurship in Developing Countries” on 3 October 2018. This is taking place in conjunction with the Informal Meeting of the EU Directors General for Development Cooperation in Vienna, Austria, under the Austrian Presidency of the Council of the European Union. The Business Forum will be facilitated by the Africa-EU Energy Partnership and is being implemented upon the request of one of its co-chairs, the Federal Ministry for Economic Cooperation and Development (BMZ), in close collaboration with their partners (e.g. the European Commission, the Austrian Government and the United Nations Industrial Development Organization (UNIDO). The Forum will be implemented for the AEEP with the support of Alliance for Rural Electrification (ARE). The Business Forum will contribute to the discussions on how sub-regional cooperation can contribute to the up-scaling of sustainable energy markets, entrepreneurship and innovation in developing countries. Moreover, it is a concrete follow-up to the “Green People`s Energy for Africa” initiative workshop, organized by the Africa-EU Energy Partnership (AEEP) in the framework of the Zambia Off-Grid-Investor Conference in June 2018. It also contributes to the Third Industrial Development Decade for Africa which identified renewable energy as an important sector for domestic value creation and jobs. The overall objective of the Forum is to contribute to the global efforts to up-scale private sector and innovation capacities in Africa to make SDG-7 and particularly universal access to energy services a reality by 2030. In doing so, the Forum will serve as a communication platform between companies/organizations implementing concrete projects on the ground and high-level directors in charge of International Development Affairs. The results of the Forum will be discussed further with financial institutions and investors in the side event “Creating opportunities for sustainable energy investments and businesses in developing countries” on 2 October 2018 in the afternoon. The overall outcome will be presented in the main Conference on 3 October 2018. 20-30 high-level participants from EU and EU Member State in charge of International Development and Affairs, representatives of regional regulatory authorities, regional energy centers and other relevant agencies are expected to join. In this context, ARE Executive Director Marcus Wiemann will launch a new ARE publication with key recommendations on how to best support start-ups and SMEs in their efforts to upscale. The African Investors for Climate Change (AICC) Network is an initiative launched during the COP22 in November 2016 to enable a rapid and effective climate transition in Africa. 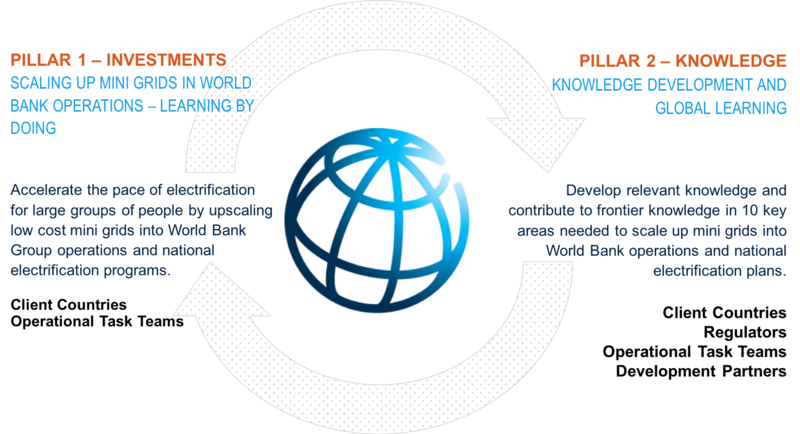 It comprises a coalition of African national and regional institutional investors with the support of international financial institutions and development agencies, all committed to act collectively by driving domestic savings and long-term institutional finance towards sustainable development and climate-smart projects. The AICC Network Launching Event B2Finance, will be held under the theme: "New Business Models for Climate Smart Projects" Bridging long-term investors and impact projects in Africa. The event offers an ideal venue to identify opportunities for investment in high-impact climate smart projects in Africa, foster the debate around relevant climate change business models for climate-smart financing, and discuss institutional and regulatory enablers to promote scaled-up financial flows. The event is also an opportunity for the AICC Network to welcome its new members and share with participants its proposed plan of Actions as a unified coalition of African institutional investors and a leveraging catalyser of private sector and foreign investors. The event will bring together 200 African and international players from public and private sector, project developers and aggregators, local governments and experts active in off-grid renewables in Africa, as well as in agro-food, telecoms, productive uses of energy. The International Off-Grid Renewable Energy Conference organised by the International Renewable Energy Agency (IRENA), is the global platform dedicated for sharing experience and best practices about design and implementation of enabling policies, tailored financing schemes, innovative business models and technology applications for stand-alone and mini-grid systems. The 4th edition of IOREC will be held in Singapore on 31 October - 1 November 2018, during the Singapore International Energy Week (SIEW), 2018 as part of Asia Clean Energy Summit – Conference and Exhibition. With over half a billion people in Asia are still without access to electricity, the synergy with the ASEAN Ministers on Energy Meeting, chaired by Singapore in 2018, and with the Asia Clean Energy Summit, will greatly help highlight the role decentralised renewable energy solutions can play in electrification strategies in the region and beyond, as well as the role of off-grid renewable energy in achieving several of the Sustainable Development Goals. ARE will organise an Exhibition in parallel with the Conference. The Exhibition gives the private sector the opportunity to present its products & projects and to showcase the technologies & know-how at the forefront of off-grid renewables. For more information about the IOREC exhibition, download our marketing offer & registration form. G-STIC is a conference series focused on accelerating the development, dissemination, and deployment of integrated technological solutions needed to achieve the SDGs. G-STIC is all about implementable solutions that are scalable, feasible and affordable both from an economic and a societal perspective. 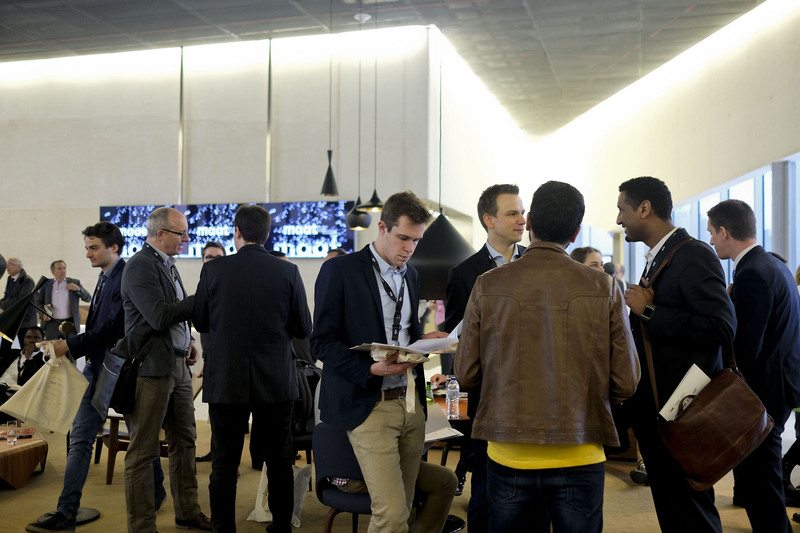 G-STIC 2017 highlighted that, to realise and accelerate opportunities for integrated technological solutions, it is vital to work across sectors, to promote new business models and value chains, to demonstrate how the combination of integrated solutions and new business models works, and to rethink local, national and global policy making. That requires leadership in sustainable development to advocate and make the changes that are good for people, planet and prosperity. analyse the impact of these tools on the decision-making process of national and local governments, investors, large and small energy players. ARE Policy and Business Development Manager David Lecoque will showcase ARE project case studies from Members that feed into the energy planning framework. 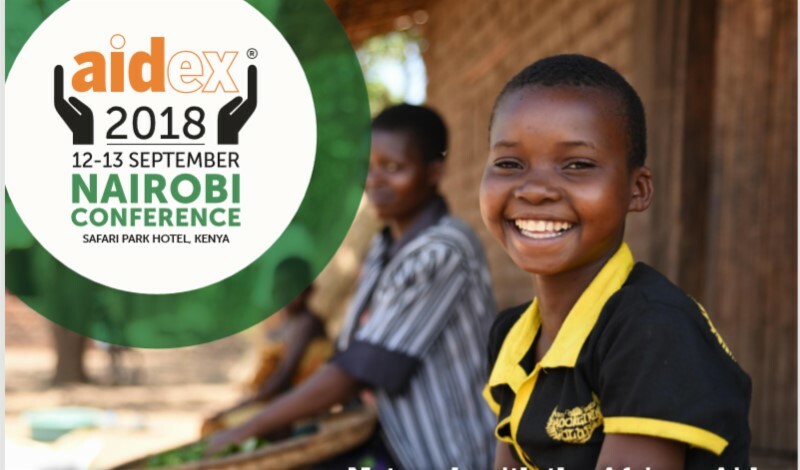 The AidEx Nairobi Conference, part of AidEx Events, has become leading event in East Africa for professionals in aid and development. ARE is happy to announce that it has established a partnership with AidEx Events to increase participation. Also ARE Members benefit from special discount rates. Building on the success of the earlier editions, the AidEx Conference and Exhibition is expected to once again attract experts from around the world across the aid and development sector, with delegates which are a mix of government, UN agencies, private sector, Kenya Red Cross and NGOs. This year the theme is Revolution in the digital age: safeguarding a future for all. How can technology contribute to positive social impact? Contact David Lecoque, ARE Policy and Business Manager (Africa) to seize these opportunities. Hosted by ARE Partner DevelopmentAid, it is now the 5th time that the event will be held to explore economic growth and infrastructure development as parts of the 2030 Sustainable Development Goals, put forward by the UN. Expected participants: 100+ delegates from Government, Multilateral Development Banks and Bilateral Development Organisations, United Nations agencies, private sector representatives, senior decision makers from the civil engineering companies and others. Off-grid renewable energy solutions have emerged as a mainstream solution to expand access to modern energy services in a timely and environmentally sustainable manner. Over the past five years, the deployment of stand-alone and minigrid systems has witnessed tremendous progress as technology costs have plummeted, innovation in deployment and financing models has picked up, and a more diverse set of stakeholders, including local entrepreneurs, the international private sector and financing institutions, have become engaged in the sector. Besides providing energy for lighting and cooking, off-grid solutions are being deployed to support the delivery of public services (e.g., education, water and primary health care), the development of livelihoods by powering productive end-uses (e.g., agriculture) and other commercial and industrial needs. Demand for electricity from small industry and businesses, which is defined as the productive use of energy (PUE), is a key success factor for micro-grids. Because of the typically low energy usage of residential customers, without linkage to and support for these energy users, micro-grids are likely to struggle to reach the critical revenue needed for financial viability. Productive users are also important to enhancing the economic and social development impacts of micro-grids and rural electrification programs more broadly. 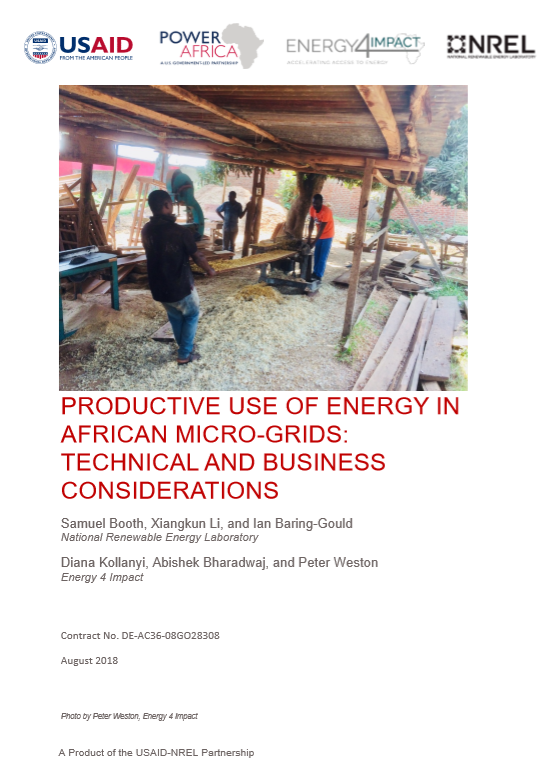 This report is part of a series of reports being developed by the National Renewable Energy Laboratory (NREL) and Energy 4 Impact (E4I) in support of the Power Africa Beyond the Grid Program and is a companion document to the Quality Assurance Framework for Mini-grids (BaringGould et al. 2016). This report is a resource entrepreneurs and developers can use to understand the technical and business model challenges related to PUE in smaller micro-grids. It focuses on small agricultural processing, and small industrial and commercial loads. The absence of publicly available up-to-date costs breakdown data on photovoltaic (PV)/hybrid mini-grids in Sub-Saharan Africa (SSA) is a barrier that needs to be resolved in order to overcome challenges in rural electrification planning, regulation, life-cycle operation, financing, and funding. The primary aim of this research is to provide better understanding of the cost structures of PV/hybrid mini-grid projects in Sub-Saharan Africa. The review on existing literature reveals significant lack of transparency and inconsistencies in PV/hybrid mini-grid costs.